Armed with every inch of height more commonly seen in a high school gym (only one player listed at 6’8”), Winthrop tried hanging on like Jeff van Gundy to Alonzo Mourning’s ankle with 3-point shooting. Going 7-17 (41.2%) from deep in the first and 13-28 (46.4%) for the game, option A, B, C, and D was slinging treys for the Eagles. Coming as a surprise to absolutely no one, Kentucky boasted a 25-11 rebounding edge at the half before ending the game with a 37-22 edge on the boards. The Wildcats’ 14 point edge at halftime was also built by shooting 18/30 (60%) from the floor. 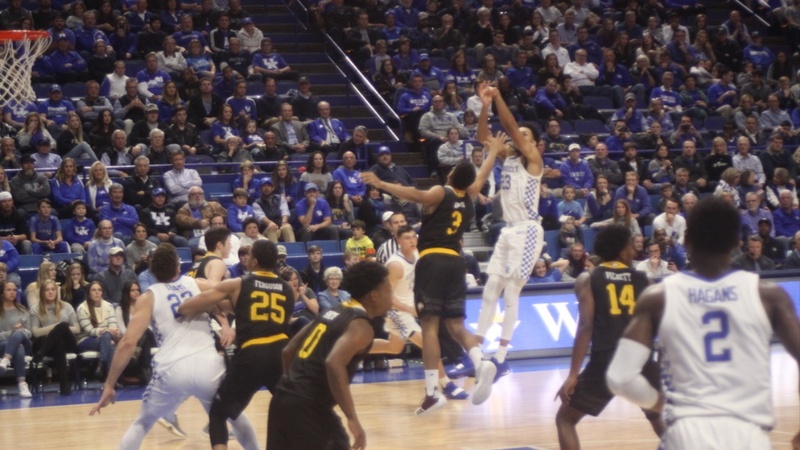 PJ Washington continued his redemption tour following some early season hiccups with 19 points, 11 rebounds, 4 assists, 3 steals and 1 block, as he and freshman wing Keldon Johnson (13 points, 7 rebounds) continue to provide some semblance of consistency for this young squad.Tyler Herro chipped in 15 points on 6-14 (3-8 3pt) shooting along with 7 assists against only 1 turnover. Herro could perhaps take over some of the point guard duties as the three leading candidates thus far (Quade Green, Ashton Hagans, and Immanual Quickley) have been inconsistent at best. Green was good for 11 points on the afternoon while Hagans, who underwhelmed with his stat line, was dialed in for much of the game on the defensive end and was a source of good energy. Defense may be the early calling card for Hagans as he builds other aspects of his game. Quickley, playing the most minutes of the three (31), finished the game with 3 points, 6 rebounds, and 3 assists. The Reid Travis for 6th Man of the Year campaign remained on course today, as Coach Calipari’s experiment to bring the graduate transfer off the bench continued. By the final whistle, he had amassed 8 points, 3 rebounds, 2 assists, a block, and a steal. Nick Richards (10 points, 1 rebound, 2 blocks) and EJ Montgomery (6 points, 2 rebounds, 2 assists, 2 blocks) rounded out the dominant interior play of Kentucky as Winthrop was clearly overmatched in that area of the court. What did we learn about this team with today’s win? Nothing we didn’t already know- there’s obvious talent throughout the roster, but we are still only seeing it in individual flashes and there is still a long way to go for this team to be successful, especially in a treacherous SEC bursting with its own talent. By the time these Wildcats are entering conference play, let’s hope that Coach Cal has drilled into them the importance of maintaining intensity and not taking your foot off the throttle late the way they did today. A more dangerous team would have taken that sliver of daylight and snatched a victory from the ‘Cats’ claws.